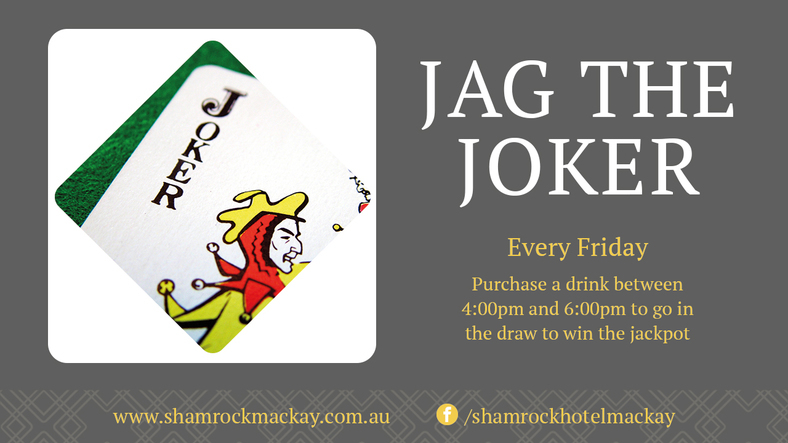 The Shamrock Hotel is the place in Mackay to dine out and catch up with great friends for any occasion. We boast exceptional indoor and outdoor dining facilities, an extensive new menu with locally sourced premium produce, a six star gaming lounge, dedicated sports bar, lounge bar, terrace and four star accommodation. 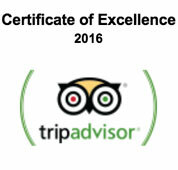 At the Shamrock Hotel, we care about your experience. So whether you chose to stay with us or just pop by for drinks and a bite to eat, we guarantee you will enjoy the hospitality on offer. At the Shamrock Hotel, we are committed to food, beverage and service excellence so that you can enjoy your experience at any occasion. Free Pool in our Sports Bar from 6:00pm. Registration begins at 6:00pm with a 7:00pm kick off. 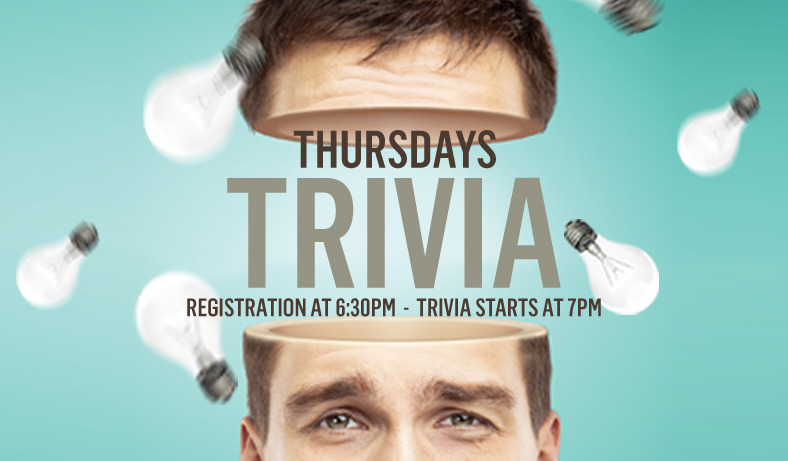 Get the group together every Thursday night and head to Shamrock Hotel to test your wits in our weekly Trivia Competition. Great spot and jackpot prizes to be won! Registration begins at 6:30pm with a 7:00pm kick off. Every Friday afternoon from 4:00pm. Purchase a drink to go into the draw to win the jackpot. Looking for another way to win on the races? Enter our weekly Tipping Competition, every Saturday in the Sports Bar, with only a $5 entry fee. See staff for more details. 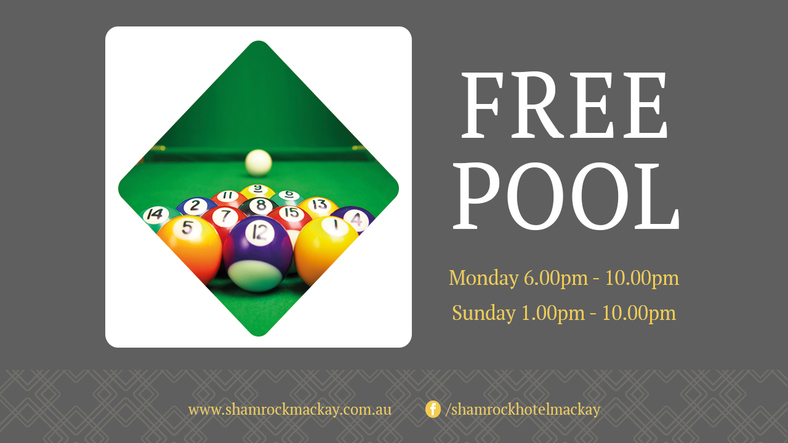 Free Pool in our Sports Bar on Sunday afternoons from 1:00pm. 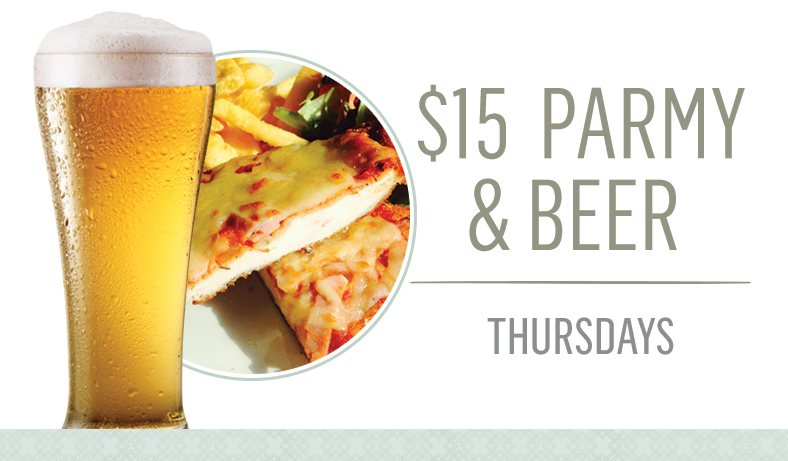 Enjoy a freshly made chicken parmigiana with a complimentary beverage* on THURSDAYS at Shamrock Hotel. Available lunch and dinner for members. Available every day for the month of March! Order this monster and receive a complimentary beverage*. We like to provide you with all the comforts you'd expect from your home-away-from-home. When in Mackay, stay with us at the Shamrock Gardens Motel. You'll love the comfortable new beds, modern furnishings and the private balcony in the Shamrock's well-appointed units. 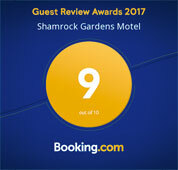 In fact we feel sure you will love everything about your stay at the Shamrock Gardens Motel. 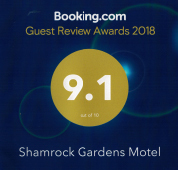 We offer disabled facilities, non-smoking rooms, free WiFi and access to landscaped gardens, pool and gazebo and of course, right next door is everything the Shamrock Hotel has to offer. Just a short drive from the airport, the Shamrock Hotel is a multi-purpose destination venue with extensive bar, dining, gaming, sports bar and function facilities aimed at providing you with comfort, convenience and enjoyment throughout your stay. A continental breakfast pack is included with every night purchased. Whether you're here for business or pleasure, choose the Shamrock Gardens Motel and take full advantage of the great facilities on offer. Located on busy Nebo Road and a short distance from both the Mackay City Heart and the Mackay Airport, the Shamrock Hotel is the perfect choice for your next function! With a focus on quality, locally sourced produce, great beverage and excellent service, the Shamrock Hotel offers an opportunity to have a unique and personalised event. With newly refurbished function rooms to cater for any type of function or event from small cocktail parties to corporate functions, birthday parties to wedding receptions; we are committed to ensuring that every aspect of your event is everything you desire. We have a friendly and professional team to offer advice and support, and we are more than happy to organise any entertainment, audio visual equipment or decorations to ensure your event runs to your expectations. Our packages are flexible as we are committed to ensuring your event is perfect. The Shamrock Hotel offers a premium gaming lounge facilities for the ultimate player experience. It’s a safe and comfortable environment to relax and enjoy your gaming experience. 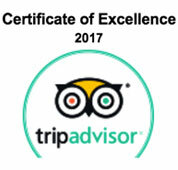 Our staff are well informed and on-hand at all times to offer friendly and responsible service. Ask our friendly staff today about joining our Shamrock Rewards for great benefits. Win a complimentary meal when you use your members card while playing. 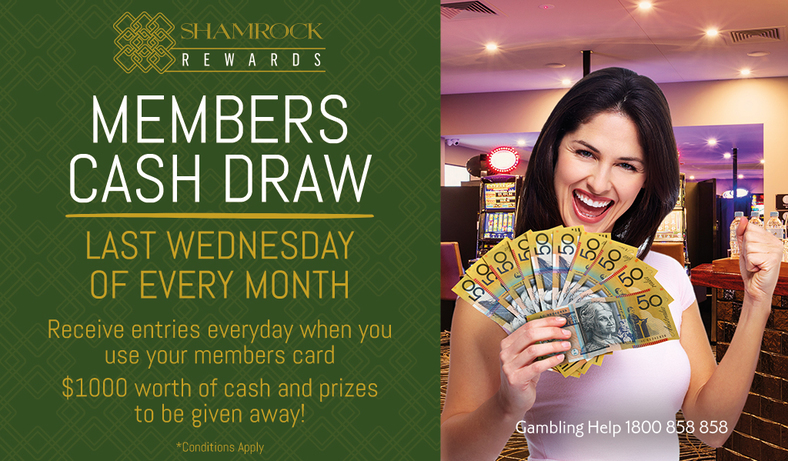 Last Wednesday of every month our monthly members draw will be held. Enter your members card during play to start gaining entries throughout the month. 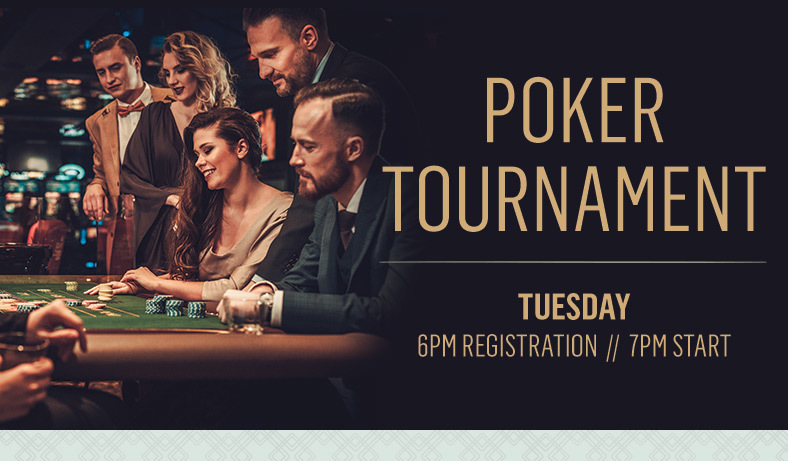 $1000 worth of cash and prizes to be given away. Must be here to win. The Liquor Stax Drive through Bottle Shop is the Shamrock Hotel’s take-away liquor outlet. We offer friendly and convenient service and fantastic value with all your beverage needs, and have extensive and late night trading hours to meet your needs seven days per week. When you work for the Shamrock Hotel, you're part of the family. We are one for all and all for one in our commitment to deliver exceptional customer service and experience. You’ll work in a culture driven work environment in a multifaceted hospitality business. Your experience will not just provide you a job, but a platform from which to launch your Hospitality career.